What better way to spend the coming winter nights than with a very large brandy, a block of choccie, something warm to cuddle up to. Plus, a delicious film noir in all its black and white gloriousness. This new BFI box set sees four classic titles that don’t often crop up on telly get a well-deserved DVD release, featuring four films from acclaimed director Otto Preminger, and one from Jules Dassin – whose 1956 classic Rififi was the inspiration for such fare as Mission: Impossible. Preminger followed his all-time classic Laura with this adaptation of the popular pulp novel. The impeccably suave Dana Andrews plays Eric Stanton, a down-on-his-luck press agent who romances Linda Darnell’s sultry waitress. When Stella is found murdered, Eric becomes the main suspect. Interestingly, the great Alice Faye was given top billing here, but her role ended up on the cutting room floor. She didn’t make another film until 1962’s State Fair. In Preminger’s psycho-melodrama, Gene Tierney, the wife of a successful psychoanalyst (Richard Conte), unwittingly becomes a puppet in the hands of José Ferrer’s malevolent hypnotist. Blackmail and murder ensue, and Preminger really does crank up the tension until the exciting climax. Considered a genre classic and shot on location, Night and the City stars Richard Widmark as Harry Fabian, a small-time hustler who wants to muscle in on Herbert Lom’s racketeering in post-war London. Gene Tierney is the long-suffering girlfriend, while Googie Winters plays the sultry wife of a nightclub host. Extras include an interview with director Jules Dassin. Dana Andrews is cop Mark Dixon, who uses his fists first and asks questions later. When a murder suspect dies by his hand, he tries to pin the murder on a known gangster, but the blame shifts to a cabby who just happens to be the brother of Dixon’s sweetheart (Gene Tierney). Preminger’s violent film noir is the grittiest in his film noir canon and marked his last collaboration with Andrews, Tierney and Twentieth Century Fox in such fare. 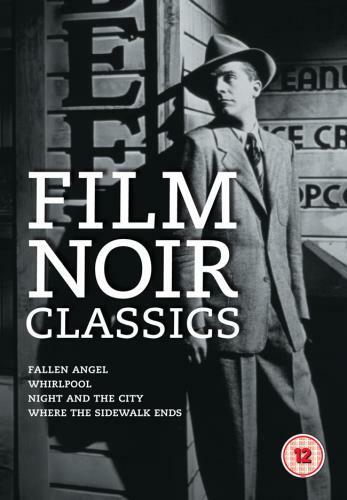 The BFI Film Noir Classics box set includes all four features, trailers and an illustrated booklet with essays, cast and credits.